The three-day Folly at the Forge brought together dozens of blacksmith novice and experts alike from around the region and as far as Canada to Black Rock Forge in Traverse City. 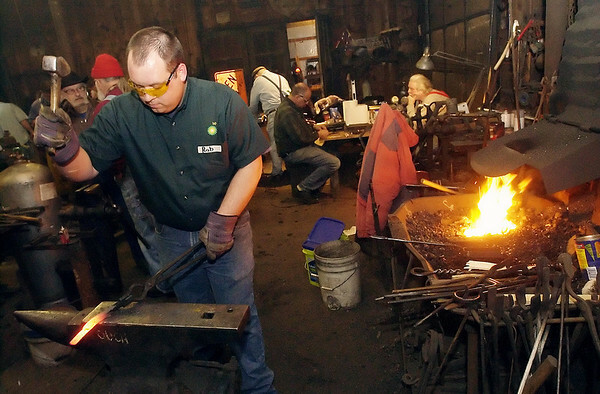 Blacksmith artisans shared their skills with new hobbyists as Dan Nickels opened up his shop for the traditional February gathering. The Folly at the Forge featured plenty of anvil space for projects, such as creating a gas forge, along with presentations from experts in the blacksmithing arts. Rob Hentschel, of Traverse City, strikes while the iron is hot on his tong project Saturday at the Folly at the Forge held at Black Rock Forge in Traverse City.